Our new holiday ornament and stamp collections are here! I can’t believe it is that time already….If you listen closely you can hear our Christmas music playing in the background. We have been super busy over here At Hello World Paper Co preparing for the crazy holiday season! Before you know it, you will be sitting at your table prepping your Christmas cards and holiday letters to be sent out to your family and friends. Addressing your Holiday cards shouldn’t be stressful or seem like a chore. It should be fun and enjoyable! Addressing all those cards with one of our custom address holiday stamps can make your job a breeze! You don’t want to hand write your address over and over again-In today’s crazy, hectic life, no one has time for that! What you need is one of our Address Stamps! We have several new Holiday Stamps in our Collection! Head on over to our Shop to get your stamp today!! 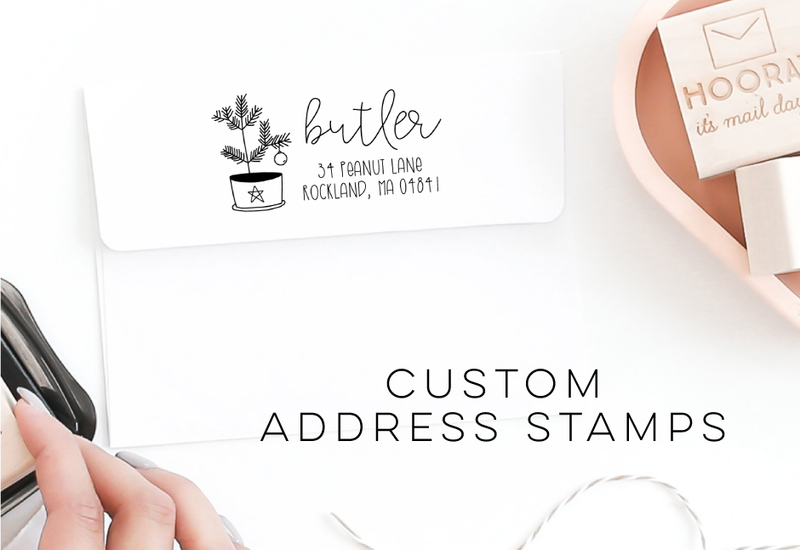 Now that you have decided on your stamp for your holiday cards, let’s talk about how to properly sign your name on your Christmas cards and set up your address stamp! When signing your holiday cards, is it Happy Holidays From the Wilsons or Happy Holidays from the Wilson’s?? This grammar rule is often confusied! I am not saying we are grammar experts, but as former teachers we do have experience with this and this is a question we receive often when creating personal address stamps! So how do I make my name plural? Let’s start with “Happy Holidays From The Wilson’s.” This is the common mistake most people make. Using the apostrophe in “ The Wilson’s” makes it show possession or ownership of something. When we send greeting cards we are not sharing something we own, we are simply sending them a greeting from your family making it a plural noun and not a possessive noun. So the proper way to sign your name on your holiday cards should be “Happy Holidays From the Wilsons.” This shows that there is more than one Wilson in your household. Now what about those last names that end in s like “Jones” or names where we may need to add “es” like Marsh? Again, remember we are not sharing something we own, we are simply greeting them! So if my last name were “Jones” the proper way to sign the greeting card would be “Happy Holidays From the Joneses or you can say Happy Holidays From the Jones Family.” Since Jones ends in “s” we do not add an apostrophe, we simply make it plural by adding “es” to the end. It’s the same situation if you had a last name like Marsh where we need to add “es” as well to make it plural. We would simply say “Happy Holidays From the Marshes, or Happy Holidays From the Marsh Family. For help with your last name, use the chart below! Now that we have covered that quick little lesson in grammar for addressing your holiday cards, you are ready to get those cards and letters written for the Holiday Season! Don't forget to stop by our shop and see all the great holiday stamps we have listed to make your holiday cards pop! We also do custom stamps as well if you need something specific! If you have any other questions about stamps or if you need a stamp please contact us through one of the buttons below!